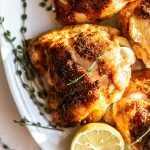 I’m showing you How To: Roast Bone-In Chicken Thighs to simplify a kitchen staple and give you an easy, healthy meal. The juiciest chicken ever! Thirty minutes prior to baking, grab your chicken thighs out of the fridge and allow them to come to room temp. This allows for more even cooking. Get out a baking sheet and line it with parchment paper or spray with olive oil. Measure all of your spices, salt, and pepper into a small ramekin or bowl. Mix the spice rub together. Remove your chicken from the package and pat dry with a paper towel. Lay the pieces on the baking sheet and drizzle with olive oil. Next, evenly divide the spice mixture between each piece of chicken, and rub the mixture in, making sure to get a good bit of it under the skin. This will lock in moisture from the oil and flavor from the spices. Place the chicken into the preheated oven for approximately 30-32 minutes or until a cooking thermometer reads 165 degrees. There should be no pink left in the middle. Before cutting or eating the chicken, PLEASE PLEASE PLEASE allow it to rest for around 10 minutes to seal in the moisture you so carefully tried to create. Once you eat or remove the bones and skin, be sure to save them for chicken bone broth!